For years and years, I lived near the coast in South Florida- both on the Atlantic side and the Gulf side. And even though I am now landlocked in the Appalachian foothills, I still enjoy the tranquility of coastal decor- whether it’s the white/aqua/tan color palette or the childhood beach memories it conjures up, there’s just something about it that’s breezy and relaxing. I mean, really, who knew decor could feel breezy? 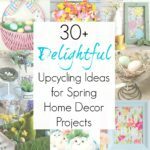 So with that in mind and the last weeks of summer in front of us, why not gather up some repurposed/upcycled coastal (and nautical) décor ideas from my fellow bloggers? Do you feel inspired to add a little surf, sand, and waves to your home now? And which one is your favorite?? All I can tell you is maybe we’ll be taking a trip to a beach cottage sooner than I thought. 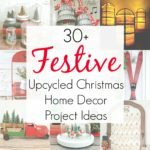 Sarah, thank you for including my wreath in your round up There are some really great and innovative ideas here. 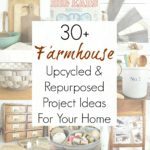 Love the round up some great ideas, especially the the oar banister. Thanks for including my scallop shell trinket dish. WOW! What an amazing collection of beachy goodness! Thanks so much, Sarah, for including my jeweled abalone shells. I’ll be pinning and sharing. I love that one of the readers is a fellow fan of yours and purchased one of your abalone shells!!! OK – which one is my favorite – uhmmm… All of them!!! Great ideas!! Now I REALLY want a beach cottage! Thanks for sharing at the Pleasures of the NW’s DIY party – and don’t forget to leave a comment – if you comment and your post is featured next week, it will also get pinned and tweeted! So much wonderful coastal inspiration! Thanks Sarah for including my stencilled table in your wonderful roundup. Will be pinning away to all my coastal boards. Every one of these examples for using nautical and beach in one’s decor deserves a higher status than crafty, I think, They all have a sophisticated and classic feel and were so thought-out and well executed. oh wow, I love them all! Especially the surf board bench and the waterski! Your bottles are gorgeous! So many great ideas, some so simple! These are great coastal projects. I love the clocks, the door, well it’s all gorgeous. Thanks for sharing at Dishing it and Digging it link party. We love having you. Love all these ideas, Sarah!! My favorite two are the clock, the bottles, and the painted fish. Our guest room is a beach theme. I made sure to get some pretty postcards before we left Hawaii and have them hanging up on the wall. you can see them here: http://skipthebag.blogspot.com/2016/06/diy-door-headboard.html Visiting from Dishing it and Digging it! That is an amazing roundup! The fish try turned artwork is a definitely a favorite! Thank you so much, Christine!!! You know I’ve been eyeballin’ the thrift store shelves for one of those fish trays!! These are all so wonderful, I love them all. I have the abalone shell with the daisy on it from MST. When I saw her post on the shells I immediately messaged her to buy it! Aside from that, I think my favorite are the seaglass bottles. Oh my gosh, how funny is that?? I love that you love it so much that you bought it from her. 🙂 MST is the best!!! I love all of these! But that barn door! Swoon! PInning! I KNOW!!! I can’t take it’s gorgeousness…too perfect!!! The creativity here is amazing! I;ve been thinking about doing a shelf with glass bottles in my bathroom. Michaels has them 70% off right now. Also doing a seashell shadow box. I love all of these. I especially like the glasses. They’re so pretty. I have some like that. I wonder if I shoudl DIY! Thanks for the inspiration! Thank you so very much, Kate! What a great round-up! I love the beach pottery clock, but those rope “stair spindles” are to die for!!! Thank you for sharing on Family Joy Blog Link-Up Party. Hope you are having a great week! great roundup! Thanks for sharing at Merry Monday! Visiting from http://www.twelveonmain.com. Have a great weekend! Thank you so much! Happy weekend to you, too!! So many great ideas this week!! I love them all – but that door – I really love that!! Thanks for sharing with us at Throwback Thursday! These are all great ideas, Sadie. I think my favorite is the salvaged barn door. Thanks so much for sharing with us at Merry Monday. I’ve always been a beach person, so I love anything and everything that is nautical themed. I love the nautical curtain rod picture that you shared. I think something like that would look great in bathroom. One unexplored option for nautical fanatics, is electronics. Most people would never even consider buying a blue speaker because it reminds them of the ocean, but I’m all about that life. Thanks for the ideas! I’ve been wanting to redecorate my bathroom anyway. I have always loved being close to the water, whether it’s a lake or a beach, so all of this nautical decor makes me so happy! I’ve been wanting to introduce more nautical themes into my home, so I’ll definitely keep some of these projects in mind. Thanks for sharing!